These are a great looking style of ceiling vent which are popular with ducted heating and cooling systems. They have excellent performance characteristics - with low resistance, excellent throw and low noise. ABS is a durable material that is UV protected so it wont go yellow over time. The easy clips make installation a breeze. Duct simply connects to the neck at the top. The cone in the middle can be adjusted to increase or reduce air flow. It can even be fully closed to shut off the diffuser from drafts or heat loss. 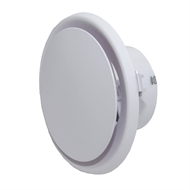 This diffuser has a neck of 250mm diameter and a face size of 400mm. Cut out size is 345mm and a cut-out template is supplied.